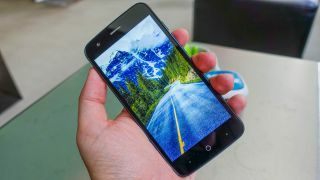 Just in case the affordable ZTE Blade V8 Pro isn’t cheap enough for you, the Chinese phone maker has launched two more Android smartphones that are smaller and lighter in all ways. The ZTE Blade V8 Mini and ZTE Blade V8 Lite are two Android 7.0 Nougat variants that bring a few flagship features to an even lower price level, just in time for a MWC 2017 unveiling. Both phones do dial back the screen size and specs from the Pro, which was announced at CES 2017. But depending on the final price, it’ll still be a solid cheap phone option for you. The ZTE Blade V8 Mini is due to launch in Europe and Asia, while the ZTE Blade V8 Lite is more narrowly focused to Italy, Germany and Spain. The ZTE Blade V8 Mini is the more powerful of the newest entries to the company’s inexpensive Blade series. Its specs match many other cheap Android phone configurations. Yes, it has a 5-inch screen that’s HD at a lower 720p resolution, but the real highlight of this cheap smartphone is the dual camera setup round back. Its 13MP and 2MP sensors combine to take photos that are supposed to mimic the shallow depth of field effects you can get with a DSLR, and from the new iPhone 7 Plus portrait mode. In addition to letting you change the focus point of photos in post-production (even the new iPhone can’t do that), the ZTE V8 Blade Mini camera also supports 3D shooting to generate 3D photos, and auto HDR. It measures 143.5 x 70 x 8.9mm, uses the budget-focused Qualcomm 435 chipset, has 2GB of RAM and 16GB of internal storage. It’s enough for very casual smartphone users. The battery isn’t removable, but has a 2,800mAh capacity. Best of all, it runs Android 7.0 Nougat, while the otherwise more powerful ZTE Blade V8 Pro launched with Android Marshmallow. The ZTE Blade V8 Lite is appropriately named. It’s lighter on some specs, and being marketed to a younger audience looking for a quick Android Nougat upgrade. Instead of focusing on the camera here, the Chinese manufacturer is giving its Lite phone a respectable Helio P10 MTK 6750 octa-core chipset and a 1080p display. With a Full HD display, it’s able to pack more pixels into the same 5-inch screen size. But it’s left with a single 8MP camera and 5MP front-facing camera. So are you a camera person or a screen person? Its one-hand-friendly size measures out to be a similar 143 x 71 x 8mm and the battery life will be about the same with a 2,500mAh capacity battery. It has the same 2GB of RAM and 16GB of internal storage. You can read our hands-on reviews of both new handsets and more coverage from MWC 2017 as the big phones show continues in Barcelona.